Made with fresh raw eggs. Simply thaw in room temperature. 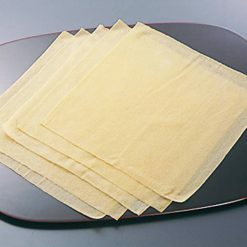 Convenient for Chakin sushi, Matsuri sushi, or thinly slice it to use as Kinshi Tamago. Thaw at room temperature and it will be ready to eat. Convenient for Chakin sushi and Chirashi sushi. Usuyaki tamago is made with scrambled egg made into a very thin, crepe like form. As it is very delicate, it can be challenging to make for some people. With Sugarlady’s Usuyaki tamago, all you have to do is to thaw at room temperature. 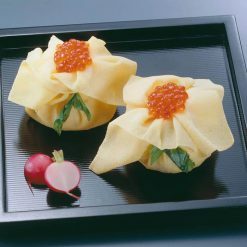 Popular uses include Chakin sushi, sushi rice wrapped in Usuyaki tamago, which is made to look like a little pouch, with its top fastened with Mitsuba or a type of herb, and Fukusa sushi is similar to Chakin sushi but the rice is wrapped with Usuyaki tamago into a square, fastend with Mitsuba. Kinshi tamago, thinly sliced Usuyaki tamago usually used as the topping for Chirashi sushi. Kinshi means gold thread. Remove from the freezer before use, and thaw at room temperature. After thawing, use caution when taking the contents out as the it is easy to tear. Ready to be used as for Chakin sushi and Fukusa sushi. To use as the topping for Chirashi sushi or add to soup and vegetable dishes, slice them into prefereable size. To make Chakin sushi, cook rice with a piece of Kombu seakelp. Once cooked, mix with vinegar, small amount of salt and sugar to make sushi rice. You can add finely chopped vegetables such as carrot, burdock, Kanpyo cooked in dashi into the rice. Place a desired amount of rice on the center of Usuyaki tamago, raise the surrounding eges and gather them at the top to make a pouch, fasten it with lightly boiled Mitsuba stalk. To make Fukusa sushi, wrap the rice to make an envelope instread of making a pouch. This product contains eggs (domestic), sugar, cornstarch, soybean oil, salt, dried bonito extract, soy sauce (contains wheat), mirin. This product is not suitable for anyone with allergies to egg, wheat or soy. Origin of ingredients: chicken eggs (domestic). Prepared and packaged in Japan.